"The whole disc is stunning—and thank you for playing my piece with such elegance and sensitivity and colouring it in ways I could never have imagined." "There is nothing superficial about the playing on this disc: Cordover plays with total assurance and an understanding of the demands of the programme: with each new track he brings colour and clarity to the music which is often lacking in other performances. This is a recording to savour and one I can thoroughly recommend." 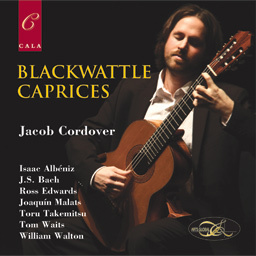 Multiple award-winning Australian guitarist Jacob Cordover presents an eclectic program for solo guitar, from Bach to modern popular songs by way of Walton and some Spanish favourites, including the title piece by Australian composer Ross Edwards.